"An informed and excoriating attack on the tragic waste, futility, and hubris of the West's efforts to date to improve the lot of the so-called developing world, with constructive suggestions on how to move forward. William Easterly's The White Man's Burden is about what its author calls the twin tragedies of global poverty. The first, of course, is that so many are seemingly fated to live horribly stunted, miserable lives and die such early deaths. The second is that after fifty years and more than $2.3 trillion in aid from the West to address the first tragedy, it has shockingly little to show for it. We'll never solve the first tragedy, Easterly argues, unless we figure out the second. The ironies are many: We preach a gospel of freedom and individual accountability, yet we intrude in the inner workings of other countries through bloated aid bureaucracies like the International Monetary Fund (IMF) and World Bank that are accountable to no one for the effects of their prescriptions. We take credit for the economic success stories of the last fifty years, like South Korea and Taiwan, when in fact we deserve very little. However, we reject all accountability for pouring more than half a trillion dollars into Africa and other regions and trying one "big new idea" after another, to no avail. Most of the places in which we've meddled are in fact no better off or are even worse off than they were before. Could it be that we don't know as much as we think we do about the magic spells that will open the door to the road to wealth? Absolutely, William Easterly thunders in this angry, irreverent, and important book. He contrasts two approaches: (1) the ineffective planners' approach to development-never able to marshal enough knowledge or motivation to get the overambitious plans implemented to attain the plan's arbitrary targets and (2) a more constructive searchers' approach-always on the lookout for piecemeal improvements to poor peoples' well-being, with a system to get more aid resources to those who find things that work. Once we shift power and money from planners to searchers, there's much we can do that's focused and pragmatic to improve the lot of millions, such as public health, sanitation, education, roads, and nutrition initiatives. We need to face our own history of ineptitude and learn our lessons, especially at a time when the question of our ability to "build democracy," to transplant the institutions of our civil society into foreign soil so that they take root, has become one of the most pressing we face." If you've ever asked yourself why so much of the world is so screwed up, you might want to read this book. It is said that author William Easterly was practically driven out of his position at the World Bank after positing some of his theories, and from the bit of experience I have had with international development agencies, I can well believe it. In short, Easterly points to Western aid dollars as the source of much of the misery in the so-called "developing" world. He traces in particular the United States' policies of giving billions to corrupt, authoritarian regimes not because they could be relied upon to use the aid to help their peoples, but because they were of (often dubious) strategic importance to US foreign policy interests. It's a long, complicated story, but told in a straightforward way that makes this book engaging reading. Easterly doesn't let the Europeans off the hook either, with England, France and Belgium faring especially poorly. If you saw the film Hotel Rwanda you will have some idea of the role that Belgium played in setting the stage for tribal warfare when it abruptly pulled out of the Congo area early last century. And then there is the perennial mess in the Middle East, a great deal of which, according to Easterly, is a legacy of England's bungling at border-drawing after WWI. All of this is detailed in a chapter toward the end of the book called From Colonialism to Post-Modern Imperialism, which draws some thoughtful parallels between the meddling that the US is doing today in Iraq and various countries around the world, and similar forays conducted by the European powers in the 19th and early 20th centuries. This chapter alone is well worth the price of this well-written and enlightening book. The more the West will be able to find searchers in the local situation for developing countries, the more the aid business will become effective for the sustainable development. Avoiding the PLANNERS's way of thinking will be helpful. The book has very concrete approach to understand how aid has been useless and how it may be made more effective. This book has a wealth of information, but is chock full of technical statistical jargon and results which makes it quite a challenge to read. It however presents extremely relevant compelling facts and arguments. I really thought I'd like this book but I think, having worked at the World Bank, he fails to take a critical look at some of their policies. If you want to see the real effect of "foreign aid" take a look at "Life and Debt" the movie or "Confessions of an Economic Hit Man". He talks of "top down" initiatives not working and he's right, but then takes way too long to make his point and the whole time I read it, I was thinking, "wait, what about what Perkins said about development corporations tricking countries into taking out more loans than they can repay for more infrastructure projects than they need, to grow their incomes less than they need to repay the loans?" and "what about countries like Jamaica that end up worse off because of the "foreign aid" that is tying up all their capital in interest at tremendous rates and killing their growth?" ON paper it looks like there is some growth but it is in the form of sweatshops that bring down the quality of life of the majority, not improvements in the lives of the poor. It's like he is talking apples and oranges - sometimes he refers to quality of life for the poor but then the "proof" comes in the form of GDP, which could easily reflect only improvements in the richest portion of the country while the poor continue to go under at an ever-increasing rate. This book by William Easterly is obviously correct in so far as it details that huge bureaucratic programs for poor people, organized by the UN, IMF, and World Bank, have not worked. The author's best example pertains to various malaria programs. He claims that 12 cents per person worth of malaria medicine is all that it takes to save a life, but, despite $trillions spent, most of the money has not gotten through, and millions continue to die, slowly, painfully and needlessly. The weakness of the book lies in its small mindedness. It dares not point out that the world's love for and implementation of goofy, inefficient, and often deadly bureaucratic programs everywhere has essentially the same effect everywhere. Welfare programs for American Blacks amounted to near genocide, Communist programs in the Soviet Union and China impoverished and killed millions, kids riot in France in the silly belief that gov't programs can guarantee lifetime employment even as unemployment rises and income continues to fall dangerously. The main source of the idea that gov't bureaucracies can be like Santa Claus was Julius Caesar, George III, and Karl Marx, and is now the Democratic Party in the United States. The intellectual antipode to this antediluvian thinking comes from the Republican Party, also in the United States, which believes, not in gov't bureaucracies, but in law and order, capitalism, limited bureaucracy, and religious/family values. Easterly's book is wonderful in detailing the precise failings of the UN, IMF/World Bank but is ultimately politically correct, meaningless, without context, and non-actionable, having failed to trace backwards to the Marxist/Democratic origins of the particular bureaucratic cancer about which he writes so scholarly. This is an interesting book as long as it stays on topic: why aid efforts do little good. The author's answer -- that there is too much bureaucracy and not enough entrepreneurship -- is given using coined jargon but the author is himself a creature of bureaucracy and that's the way it talks. William Easterly, like his colleague of forty years ago, Albert O. Hirschman, does not fall into the economists' traps in his new book on the failings of foreign aid, The White Man's Burden. Unlike many economists he neither assumes away the important issues nor does he claim "certerus paribus" (all things being equal) because all things are not equal. Rather, Easterly makes use of disciplines other than economics - anthropology, history, and political science - to make his case. Easterly's case is simply that grand plannning at the national and international level will fail, and therefore, so will the planners. He rests his hopes on what he calls "the searchers." 35 years ago, in my own doctoral dissertation in political science, on local development in the Peruvian Andes, I came to a similar conclusion. My data demonstrated quite conclusively that the key determinant of development was good leadership. Good leadership rested on listening to local people, who knew perfectly well what they needed, and finding the resources to make it happen through imaginative, often "out of the box" solutions. As Easterly demonstrates, good government results in development, bad government does not. Easterly often uses procedural democracy and a low level of corruption as proxies for good government. These are certainly as good indicators as any I know of and encompass the principal variables that Max Manwaring and I have used in another context in our own studies of the dimension of legitimacy which we have been working with for the past 20 years . I have two relatively minor quarrels with Easterly. First, his argument strongly suggests that programs like the U.S. Peace Corps (and its NGO, international, and host nation counterparts) would be effective vehicles for searchers promoting development solutions that work. Yet, nowhere in the book does he even mention the Peace Corps. My second quarrel is with the starkness of his dichotomy between planners and searchers. No successful business, no successful organization eschews planning. Planning and plans are essential. But there is an old saying among soldiers that injects a critical note of reality into planning, "No plan ever survives contact with the enemy!" For that reason, military planners try to include what they call "branches and sequels" and have a mechanism to change the plan on the fly called a "Frago" - fragmentary order. The bottom line is that Professor Easterly has written a very good and important book that has the additional virtue of being a good read. While it is not perfect, it is serious and an important contribution to a dialogue that needs to be more broadly joined. I work at very senior levels of business and government in the international sphere, mainly centered on using information technology to leverage innovation. I dine (albeit occasionally) with Ministers of this and that. My frustration is one shared by more and more of us international wanna helpers: the ideological, empirical and economic failure of the World Bank/IAD well-intentioned Big Push mentality. Easterly's book is the ammunition I need in my own work in Asia, Latin America and Eastern Europe. We have to shift from...... well, just read the book. It's good scholarship, tense and committed without being vicious and polemic, clever in the best sense of the term and basically uncontestable in its evidence. Easterley makes an en passant comment about that great counter-conventional thinker Daniel Moynihan, who so superbly and, alas, ineffectually highlighted the inevitable disaters that well-meaning policies to reduce Afro-American urban proverty would lead to. I think Easterly is in the Moynihan class. Iy you are like me a political liberal, an international nomad, and an economic realist, you need this book. If you are in any way involved in international development, you will have to read it anyway if only to disagree with it. A thoughtful approach to an emotional topic. When a group of people who have a lot are exposed to the plight of those who do not, there is a visceral reaction sparking a desire to help immediately. To most people, it doesn't matter how the help is delivered, just so we do something, anything to help. Easterly begins his analysis of the West's foreign aid efforts with that noble intuition and then does what so many people fail to do; he digs into whether our well-intended efforts have paid off or not. His results are discouraging. $2.3 TRILLION of aid from the West to the Rest (as he calls it) has done very little to actually improve the lives of those who live there. Easterly's book is all about statistically demonstrating the general ineffectiveness of the West's aid, breaking it down into differing types of ineffective aid and showing why each type of aid fails. But all is not lost. Easterly is not against aiding the Rest, but he does believe that continuing to presesnt aid in ways that have always failed is a truly sorry approach to the problem. Easterly gives many examples of programs that have worked and picks out the defining qualities that differentiate them from the programs that fail. By the end of the book, you have a much better understanding of how we might more effectively approach helping the rest of the world get on its own two economic feet. Why do World Bank billions, U.S. Agency for International Development grants, and International Monetary Fund "Poverty Reduction and Growth Facility" loans disappear into the sand, for the most part? As Easterly shows, these programs are designed primarily to reflect the interests of the donors ("The Rich") and their perceptions of what is best for the recipients ("The Rest"). Every few years, a G-8 summit of world leaders or a similar gathering declares a grand utopian "big push" to eradicate poverty in Africa or to provide universal access to water and sanitation or to accomplish a similar objective. The current Big Idea is the set of eight "Millennium Development Goals" for 2015, launched with great fanfare at the United Nations in September 2000. Because most of the goals are utopian, they not only fail, but they divert resources from activities that might actually do some good. Problems are compounded because the donors' cash is administered by "the Planners" (aid bureaucrats), who are largely unaccountable for results. Top-down goal setting and the planning mentality effectively shut out information about what is really needed on the ground and any useful feedback about why projects fail or, in rare circumstances, succeed. Compounding these inherent weaknesses of Rich largesse for the Rest, most of the poor countries have bad governments, wherein aid money is siphoned off to Swiss bank accounts, and corrupt officials sabotage the workings of rudimentary markets, increasing the cost of doing business and discouraging private investment. What is needed, according to Easterly, are empowered "Searchers" on the ground--business or nonprofit entrepreneurs, for instance--who understand the needs of the poor and the institutions within which they live, who have tangible incentives to meet those needs, and who are encouraged to experiment on a small scale. A excellent example Easterly gives is the distribution of insecticide-treated bed nets in Malawi for protection against malaria. Despite his robust attacks on the foreign-aid mainstream and its institutional embodiments, such as the World Bank, Easterly suggests that there is room for modest interventions, particularly in such areas as public health (recall the success story about the mosquito nets). Such activity can be subject to an experimental quasi-market process whereby the potential aid recipients select the agency to deliver the assistance, perhaps through a voucher system. The spirit of Easterly's approach is captured by his characterization of his own suggestion as possibly "the stupidest idea ever, except for all the ideas that have already failed in foreign aid" (p. 379). Free markets work, Easterly emphasizes, but they cannot be imposed; to work effectively they need a supportive political and institutional environment, as any student of the former USSR or the U.S. health-care system can attest. For developing countries especially, the emergence of effective markets will be in "piecemeal, experimental steps." To reinforce this point, Easterly highlights the World Bank's "Doing Business" project, perhaps the most effective antipoverty initiative in its entire history, in my view. The bank documented the time and cost of such activities as starting a business, getting credit, and enforcing contracts in 155 countries. It then constructed and published (with yearly updates) an index of the ease of doing business in each country, [...]. The correlation between "ease of doing business" and income per capita is striking.... Today, government ministers in dozens of countries are publicly striving to move up in the rankings--and are claiming credit when licenses are eliminated and nuisance taxes abolished, as I observed recently in Turkey. In other words, peer-group pressure generated by widespread publicity of such indices may be even more effective than trying, in effect, to bribe ministers to adopt sensible policies with nonsensical loans and grants. Easterly's points are enhanced by his historical perspective and a lucid pen, as well as by his substantial published research and time spent in developing countries. However, his thesis is muddied somewhat by an extended foray into political science and an attempt to evaluate the costs to the growth of developing countries incurred by British colonialism and U.S. Cold War interventions. In addition, his analysis gives insufficient attention to the not-infrequent occasions when major donors use multilateral lending and grants to reward friends and withhold them to discipline the recalcitrant. Professor Easterly lays out convincing analysis for the lack of results in areas of foreign aid and development. His synopsis of altruistic planners developing overambitious plans with little historic and cultural knowledge of the people they want to "help" enlightens readers. Easterly proscribes no overarching strategy or plan, rather a new approach to actually having an impact. He proposes that small, targeted piecemeal efforts with accountability have been the only assistance that has made a true impact. His recommendations will be sure to receive resistance in the aid community, as well as by policy makers appealing to US constituencies. However, those who count the unfortunate people in developing countries as their accountable agents will find this book helpful. Professor Easterly speaks from experience as an economist with the World Bank for over sixteen years. As someone who understands global economic assistance from the inside, his legitimacy carries weight. His humor finds an audience with those of us who have been struggling on the ground trying to enact policies and interventions dreamed up in Washington, New York, London, and elsewhere. The cheeky attitude adds the right touch to the basic economic models and logic referenced within. This is applied economics at its best. Well worth the read for all policy makers and implementers, whether in government, the military, NGOs or other philanthropists. This book is not what I would call a well-written book. It is, in fact, quite tedious to read, due to the writing style of the author - he often belabors a point to death. This is especially so for what I imagine to be his target audience, who would not be exposed to many of his notions for the first time. Now I do think this book is well-worth my reading time. Reading this book is, to be truthful, quite sobering. Some of us hold the notions of democracy and free market in such high regard that it is almost a faith - no doubt to some it is a faith - and that is the simple solution for the affairs of mankind. Easterly shatters that simplistic view by showing readers that, although democracy and free market are good, cannot be engineered with a template for a quick success, and surely they cannot be imposed from the outside -- past efforts in this regard have yielded a dismal track record at best, sometimes with disastrous consequences. Successful democratic institutions have always been a result of evolution, based on the culture and traditions of a people, and through gradual changes and adaptations, the direction pace of which is largely determined by the people themselves. This is how democratic systems take hold. This is a disturbing revelation to the "planners", liberal and conservative alike, who believe that with good intentions and good methods and lots of money, they can do no wrong. Interestingly, on these review pages, some criticized Easterly for offering only anecdotes of small successes but no real scalable solutions. These critics completely missed the author's main point: there are no "scalable" solutions. Foreign aid has been an enormous failure over and over again for the last 50 years. To be sure, there have been successes in health and education and humanitarian aid keeps the level of starvation fairly low in most of the world. But 2.3 trillion dollars later the efforts of the UN, rich countries, do-gooders, aid agencies, and economists to lift the majority of the world's people out of poverty have failed. There can be little argument about that. The author of this book has a pretty good explanation why. The "planners" -- bureaucrats and foreign aid officials -- control the aid process and aid has gone to sterile governments but not the "searchers" -- clever individuals looking for opportunities. (Jeffrey Sachs and Bono: are you listening?) In other words, if you want aid to work, put it in the hands of aspiring entrepreneurs. That's a simplified version of the author's theory. It will appeal to those who trumpet the glories of capitalism -- but the author also identifies failures of the free market in, for example, post-Soviet Russia. I'm not opposed to foreign aid; in fact I think it should be increased, but I agree with the author that it should be market oriented and relate to the demands of the poor -- not the demands of the utopian dreamers, academics, and flim-flam men who run governments and aid organizations. Most aid organizations produce more paper than anything else. The author writes in an amusing, self-deprecating manner that makes this book more accessible than many tomes on the subject of economic development. He endears himself to me by taking a few shots at the nutty neo-cons and their blind faith that the solution to all international problems is for the U.S. air force to bomb somebody. You might want to skip through some arid passages, but all in all it's an excellent book with more wisdom on the subject of foreign aid than most in the genre. In this book Easterly provides a very nice overview of current foreign aid policies of governments and international organizations, and why they have done so little to help the poor world. Lack of accountability, perverse incentives, and a "central planning" mindset has hurt, rather than helped, the poor world in Easterly's view. The latter part of the book proves to be rather disappointing, however. Here, Easterly tries to prove that military interventions (peacekeeping, peace enforcement, and invasions) have not been very effective in bringing about peace and prosperity in the target countries. Easterly is probably right, but the evidence is lacking, and Easterly comes across rather emotional and, well, rather flippant in this part of the book. "idealism, high expectations, disappointing results, cynical backlash"
I have been a self-described Easterly fangirl since reading his excellent book The Elusive Quest for Growth. In that book, he had managed to be precise, supported, readable, humane and funny-- all at the same time. In the world of reading about development economics, this was no mean feat. I had known that this book was out for a while, but had only gotten around to reading it after seeing Easterly here in Amsterdam. He was debating Jan Pronk about what he calls the difference between Planner- and Searcher-based methods of developmental aid. Planners, in his terms, prefer the sweeping top-down approaches to poverty eradication-- all governed by a central committee somewhere else. Searchers adopt a more piecemeal approach to solutions, looking from the bottom up without benefit (or as much benefit) from Utopian ideals. It was a very interesting debate. The audience was full of folks working in various NGOs and developmental organization. It inspired me enough to go ahead and buy The White Man's Burden. The arguments that Easterly make feel so intuitively correct that they make me suspicious. The bottom line for him seems to be that real situations are individual, and solutions cannot be extrapolated from overriding principles. He is savage towards the unrealistic thinking of the neo-imperialists and unsparing of many of the political sacred cows. He points out that given limited resources, tradeoffs do have to be made. Too many people forget that even given unlimited funding (which is far from the case), resources can still be scarce-- attention, will power, distribution infrastructure, etc. He also says that if goals in aid programs are failing, then throwing more money at them will not help. I think that Easterly's stand is often miscontrued based on the last point. I have heard detractors say that he is arguing towards limiting aid to the needy poor. There is no substantiation of that-- at least not in his books or in the lecture I attended. Instead, what he argues is that if unrealistic goals and cumbersome structures prevent aid from reaching the poorest, then adding more money on top of the pile will not fix the problem. For any experienced project managers out there, this is going to feel very "right". Easterly is not calling for less spending; he is calling for more sensible spending. He is calling for accountability, practicality, focus and honest evaluation. These are things that should be self-evident, but are apparently very difficult to achieve. He asks the very disturbing question whether the developed countries are more interested in selling their personal ideology in the form of a Utopian vision than they are interested in achieving real change on the ground where it is needed the most. Other topics include examples of successful "Searcher" strategies for bringing change to the life of the poor; historical numbers looking at the effect of aid on growth; a discussion of the different aid agencies and their limitations; and some thinking about the role (or lack of one) in local governments when it comes to development initiatives. William Easterly uses a direct and facts supported language. He openly criticizes aid efforts done by international agencies where, most of the time, nobody is accountable for results, and also where invariably large economic funds are channeled through incompetent, corrupt, and sometimes tyranic local governments. The author encourages the aid donors to make sure the funds reach the most needed, skipping the big plans built from top down, and instead helping the searchers (individuals that find solutions to practical problems) do their effective work. Through decades he cites many examples that give light to succesful efforts (Japan, South Korea, Hong Kong, Taiwan, and so forth) where the white man's hand was no visible at all. Easterly's work views the zaga for helping the poor totally different from what Jeffrey Sachs asserts on his book, The End of Poverty. Easterly gives strong reasons to predict that the strategy behind the Millenium Goals will fall short, once again proving that bureaucratic schemes don't work and only provide arguments for rich governments to justify that much is being done on economic improvement for the poor nations. 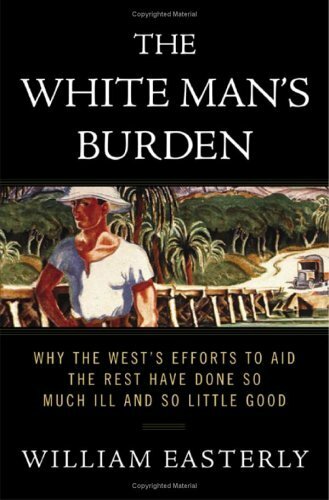 I strongly recommend Easterly's White Man's Burden book, especially to people really interested on building succesful development strategies. Besides, Easterly is much in line on what Amartya Sen wrote in his magnificent book "Development as Freedom". Here, William Easterly lifts the veil of fog and proceeds to make a big dent in our collective ignorance about the "ways of global poverty" and in the process tells us what "not to do" in trying to surmount it. His trenchant critique gives a whole new meaning to the biblical philosophy: Give a man a fish and you feed him for one day, but teach him to fish and you feed him for a lifetime," as well as to the well-worn adage that "the road to hell many times has been paved with good intentions." Always sharp, relevant, wise and delivered with the authority of a man who has "been there, done that, and bought the tee shirt," This is the testimony of a man who has wrestled in the trenches with the problem of global poverty and lost so many times that he has now figured out what he and everyone else have been doing wrong. He is like the "Archie Moore of Global Aid programs." And at least in principle Easterly now knows the score and what needs to be done to get global poverty right. His experience, his logic, his tenacity, the crispness but lightness of his writing, and his bravery in taking on the conventional wisdom (and all of its embedded sacred cows), convinces me that Easterly is the real deal; and that if he does not know what he is talking about then no one does. While beautiful heartfelt and compassionate ideas coupled with a plan and money (so far the West has spent more than $2.3 trillion with minimal results), does indeed constitute a "valid" global poverty eradication program, it does not in fact constitute a "viable" one. And here is the twist: The difference between "valid" and "viable" is not just semantic or symbolic fluff, but the difference between success and failure. The presently used "so-called" valid formulas have been tried and have failed so often that they have long since passed the point of violating Einstein's maxim of how insanity is defined: "repeatedly trying the same old techniques and expecting a different result." The reason this formula may be "valid" but not "viable" is that unlike the distribution system that got nine million copies of JK Rowley's book "Harry Potter" into the hand of kids in less than a week, once the boxcars of food are dropped off in some godforsaken Third world desert, there is no well-oiled, well-motivated distribution system available to see that they then get to the needy. Most of those in need have no way of knowing that aid is available, and because of poor infrastructure, could not get to it even if they did. The incentive under such circumstances is for the lucky handful to use the "the White Man's" largesse either for the benefit of the immediately available and powerful few, or as a basis to begin the process of bureaucratization, which in the end amounts to the same thing. But Easterly knows as well as the rest of us, that even under the best of conditions, and even in the First World, bureaucracies exist only to siphon-off the resources to better perpetuate their own existence, and not to service their client, the poor, or to end poverty. It is the author's repeated and vivid analogies that drive home all of his key points. For instance, one of the reasons his "motivated middleman strategy" seems to work when bureaucracies do not, is that middlemen "gets paid" only after the end product is delivered to the recipient - whether that product is drugs, prostitution, Harry Potter Books, or poverty eradication. On the other hand, "poverty bureaucrats" (in the U.S. we call them poverty pimps) get paid "up front" for merely showing up on the job. There is no accountability or follow-up or even penalties for undelivered products, and thus they remain unmotivated to get the products out to the recipient. When this disincentive is coupled with local obstacles, such as lack of distribution infrastructure, ignorance or local politics, then it is easy to see why poverty aid has become a magnet for bureaucratic corruption and political machinations rather than for the eradication of poverty. What is the solution to Global Poverty? Easterly thinks that grandiose goals must first be tapered or given up altogether: Ending global poverty is not going to happen any time soon, if ever. And "having ending it" as an immediate goal is impractical and ultimately self-defeating. However, if we keep our ears and our aid close to the ground where micro-management is implicit and becomes "built in" rather than explicit, we can make a big dent in poverty by creating opportunities locally where none existed before. When we educate poor kids, especially girls, and otherwise use what people on the ground need and know, we are actually leveraging that knowledge into a force multiplier, that ripples horizontally across the landscapes of the poor, and trickles across rather than telescoping downward as is the case with bureaucratically driven models. In doing so, grassroots approaches have just the opposite effect of getting trapped in cycles of bureaucratic red tape: They tend to maximize the distribution and immediate utilization of scarce resources rather than minimizing and even working against them. But also implicit philosophy is being "tapped" in Easterly's reasoning. It is the same philosophy that has shown proven results and has been successfully exploited by notables such as the Noble Laureate Muhammad Yunus in his micro-lending programs in Bangladesh. It is a philosophy that is so often ignored that it has become a leitmotif of bureaucratized Aid Relief Programs: People on the ground often know better how they are best to be helped than bureaucrats in capital cities, or those with good intentions writing impersonal checks in far away lands. What people need is not the equivalent of America's Thanksgiving day handouts of old canned goods, but the dignity and connections that go with being able to create ones own opportunities. It seems that the biblical adage of give a man a fish and feed him for a day, or teach him how to fish and he will feed himself for a life time, works better in the world of global poverty than does Aid bureaucracies. William Easterly has done it again. It's hard to believe that there would be much left to say about the mess that has been development aid after his devastating critique in The Elusive Quest for Growth. However, five more year of observation and research on Easterly's part have created an even more comprehensive picture of the problem than his earlier book. * Less economic analysis (though there is still plenty to interest the serious reader) and more fascinating anecdotes, so this is more appropriate for the general reader than Elusive Quest. * Same lively writing style; it's a page-turner. * Wonderful case histories of sucessful countries like Botswana, thus a little more hopeful feel to this book. "Give a man a fish and he won't go hungry for a day." The western world has sent a lot of 'fish' to Africa, well-intentioned charity, food, foreign aid, clothing, supplies. But too much of those 'fish' have ended up rotting in warehouses, in the hands of government officials and not people who need the fish, or putting local fisherman out of business, when they can't compete with free fish distribution. "Teach a man to fish, but he won't go hungry again." Nice idea, but sometimes there aren't any fish in the sea, or the people don't live near water, or they end up overfishing the waters. Some western practices don't fit the climate or culture of Africa, so all the fishing instruction in the world won't solve the systemic problem. "Teach a village to raise fish." Now we have something. A skill. A chance at economic development. Not for one person, for lots of persons. Something enduring. Africa needs help in learning to help itself. That doesn't mean that starving people should be ignored. It means that feeding them for a day, a month or a year does not solve the long-term problems of Africa. Worse, this charity leaves some people satisfied that they have done their share of social responsibility and leaves some people -- westerners and Africans --mad that fish are being given away. Easterly shows that the first form of fish relief, however well-intentioned and executed, perhaps does more harm than good. And he knows that teaching fishing is sometimes not that helpful. But long-term, sustainable, wealth-creating, economic development works. Microenterprise, microfinance, granting people title to land that they can leverage into loans -- these are some of the tools that we can teach and that Africans can use. Yes, the west has done many, many things in Africa about which we can feel guilty, but charity is not the solution or the ablution. Excellent - Helps Understand Foreign Aid Problems! After 50 years and more than $2.3 trillion in aid from the West there is shockingly little to show for it, says Easterly. Almost 3 billion people live on less than $2/day (adjusted for purchasing power). Eight hundred forty million don't have enough to eat, ten million children die/year from easily preventable diseases, one billion lack access to clean water, two billion to sanitation, and AIDS kills three million/year. So begins Easterly's criticism of Western aid efforts. Another major point is that bad recipient government is a much better statistical explainer of poor economic growth than being in an initial poverty trap - members of the latter change over time (11 of the 28 poorest countries in '85 were not in the poorest fifth in '50). In Russia's case, Soviet plant managers were able to evade the new rules, while tycoons snatched valuable firms up at bargain-basement prices in return for supporting Yeltsin who excluded deep-pocketed foreign firms. Lack of checks and balances on greed/cheating prevents economic development - eg. passing off poor quality, reneging, theft, lack of property rights, incomplete, incomprehensible, and ineffective laws and courts (eg. slow, bribable) are more specific major government problems in addition to government theft and graft. Buying off journalists also helps corruption. Yet, the worst governments get lots of aid - the 25 most undemocratic out of 199 rated by the World Bank got $9 billion in '02, often to support U.S. military purposes. Non-merit recruitment of staff and rampant absenteeism result. Failures are covered up with positive spin and bureaucratic mumbo-jumbo. Foreign aid is also made overly-complicated by having many different aid agencies involved with different objectives. The "good news" is that despite zero-growth payoff on aid to Africa, there has been a fall in infant mortality, rise in clean water access, and a rise in secondary enrollment. Perhaps these were more successful because their outcomes are more easily monitored than comprehensive reforms. Unfortunately, donors don't always follow research - e.g World Bank staff have found spending on educational instructional materials provides up to 14 times the return on physical facilities - yet, many donors prefer new buildings. Still another problem is tying aid to a donor. For example, 75% of U.S. money must be spent on U.S. supplies/suppliers. This reduces choices, increases costs, and involves those less familiar with the situation. Another example is focusing on AIDS treatment instead of prevention of this and other diseases, and abstinence in particular (doesn't work). Easterly notes that the U.N. is especially ineffectual because it answers to 191 members, with conflicting goals. Finally, Easterly notes that the U.S. approach to "fixing" Iraq's economy modeled that of our earlier failed in Russia. It would help if we learned from our mistakes. The main thing I do share with Easterly is his disdain for the rockers and the dreamers. However, beyond that, the main theme of this book is a simple tautology--if it works according to whatever criteria he stipulates, it's a "Seeker," if it doesn't, it's a "Planner." And lo and behold, the Planners are the bad boys, because they never succeed. There is nary a recognition of the fact that if you want to "seek" to help the poor somewhere, there are always those pesky governments to deal with. Just one example: he argues that the amounts of money that have been spent on roads in developing countries have ultimately had little impact in many situations, because roads deteriorate. So he recommends that donors need to build maintenance into their programs. Alas, in many parts of the world road maintenance is a job for the local government (which he acknowledges by citing how he deals with a pothole in the States). Now is his recommendation tantamount to suggesting that donors build up local government in developing countries, run by -- what, contractors? Interesting concept. While in my late twenties I traveled throughout the third world for nearly four years like a forerunner to the present day backpackers. Of the zillions of situations I encountered while staying in flea bag hotels, riding chicken buses, going deck passage on over crowded freighters, hitch hiking through central Africa, one memory stands out. I was crossing through Tanzanian immigration near Arusha. The Black Tanzanian immigration officer asked an older Austrian gentleman in front of me what his occupation was. The Austrian in broken English replied, "I'm an expert." To which the Tanzanian remarked, "Just what we need, another expert!" Want to understand the World? I highly reccommend this book to anyone interested in understanding the world as it is. Economic, political, and historic factors make the world we live in, with the sharp contrasts inside and inbetween countries. Easterly efficiently describes why such constrasts exist, and what can be done to reduce inequality, at several levels (e.g. national policies, political programs, local development). For anyone interested in social development, or just in knowing why some people don't have food in their tables everyday, three times a day. As a former Peace Corps volunteer in Africa -- but someone without a lot of formal training in macroeconomics or knowledge of the politics and history of the IMF, World Bank, and associated other organizations -- I picked this book up hoping for a cogent and intelligent perspective on the "larger picture" driving what I observed on the ground. I wasn't disappointed. Easterly arrives at many of the same conclusions I did, backed up with reams of analysis and a deep understanding of the nature of the IMF, World Bank, etc., as well as the historical roots explaining why they are the way they are. I found the book to be slow-going in parts, but that's probably more because much of the content was totally new to me: it's dense, but that's a good thing. And even though it is dense, I thought it was very readable. One thing that I thought would have been valuable was more of a discussion about how a foreign policy oriented around a bottom-up, "Searcher" type approach could be sold. He acknowledges that the reason "Planner" solutions are so popular is that they make us feel good, like "something is being done" -- but, unfortunately, the psychological power of that is so strong that a fundamental shift in policy will not occur simply on the basis of rational evidence that it doesn't work. That said, I don't think it's impossible: it's just about appealing to a different aspect of our psychology. Peace Corps, for instance, I think does a pretty good job of selling the Searcher ethos, and it does so by emphasizing the small-scale stories of success, as well as the OTHER benefits of being a Searcher (such as learning from the other cultures). A Searcher-based foreign policy, on the larger scale, could sell itself similarly -- buzzwords like "empowerment" and "grassroots" spring to mind. Anyway, I would have appreciated more of a discussion about that (or, if these ideas are silly, a discussion of exactly why).